I have a little thing for chocolate chip cookies. I haven’t made any for myself in a while. But when the coupon for Nestle chocolate chips showed up in the newspaper last night, I just couldn’t help it. I had to buy a bag! As I was preparing the batter, I thought to myself, ‘If I’m really going to make these, I might as well “healthify” them. Right!!??!! Toss in some whole wheat and some flaxseed.” Justify. Justify. In KitchenAid, or in bowl using hand mixer, combine butter and sugars. Add eggs and vanilla. Beat until creamy. In medium bowl, combine and mix baking soda, salt, wheat flour, white flour and ground flaxseed. Add flour mixture to mixture in the KitchenAid. Mix until batter forms. Stir in chocolate chips. Spoon tablespoonfuls onto baking sheet. Bake at 350 for 9-10 minutes. Cool on cooling rack. Sounds good! I want to try them! GRRR. I meant “I’ve DREAMED of you”!!!! Um, you are the reason there are bite marks in my computer screen now. And why there is now drool gunking up my keyboard. And why I’m sitting here scratching and sniffing that picture of cookie dough. DO YOU KNOW WHAT YOU JUST DID TO ME?? I am jealous of a good chocolate chip coupon. I have been hoping and hoping for a good coupon/sale combo, but there haven’t been any. My $.35/bag stash is running low. Have you ever tried replacing the butter with apple sauce? My experience is that if you do 50/50 butter/apple sauce, the cookies come out pretty well. Try that with whole wheat flour & flax seed and it’s even better. Or course, once you go that far, you can start considering splenda. But, if you get carried away, the science experiment cookie starts resembling (and tasting like) frankenstein. I added flax seed to some chocolate chip cookies a while back, and replaced the white flour with spelt. They were the best cookies I have ever tasted! Mmm! I love the idea of adding flaxseed! I need to start just throwing that into more of my recipes. Thanks! I too have a thing for chocolate chip cookies. I have found that if you use just one stick of butter instead of two they taste just as good. And they will be healthier. I will have to try adding flax seed to my recipe. Oh if you eat these and drink a diet soda at the same time does it cancel out ALL the calories? I think it might work!!! These sound very good! Thanks for the recipe. I have a little one with milk and egg allergies and ground flax seed is a near perfect substitute for eggs. I use a recipe almost exactly like this except I susbstitute soy margarine for the butter and 1Tb ground flax seed mixed with 3Tb warm watter for each egg. I actually think they’re a bit chewier with the flax seed which is just the way I like ’em. yum. now i’m going to have to turn on the oven. Aww, if you’re gonna go the junkfood route, do it right. FULL FAT!! I finished baking them about an hour ago and they’re deicious!! I can’t wait for my husband to come home to chocolate chip cookie smelling house 🙂 Thank you for this great receipe! All you have to do is add flaxseed and they can be called health food. lol They look delicious. Did you hide them from the kids? *ugh* you would have to remind me of my 2nd favorite cookies (my absolute favorite is peanut butter)! And me with no chocolate chips in the house! Seriously though, I’ve been known to “healthify” mine even further by using egg substitute instead of the whole egg & Smart Balance Butter Blend (stick) instead of the real butter. I agree – some health is better than none! And if you can include healthy food into treats that your family will eat, that’s a lot better than pure junk food treats! 🙂 I just have to make sure that I don’t fall into the trap of making “healthy” treats more often just because they’re have some healthy stuff in them! Thanks for sharing! I agree – some health is better than none! And if you can include healthy food into treats that your family will eat, that’s a lot better than pure junk food treats! 🙂 I just have to be careful that I don’t start making “healthy” treats more often just because they’re have some healthy stuff in them! LOL Thanks for sharing! Use Egg Beaters instead of regular eggs and 1/3 less fat butter and they are even MORE healthified! I’m all for healthy chocolate chip cookies, girl! Yumm-o (bet you heard that recently). I’ll be trying these!! I love chocolate chip cookies too. Make them even better by adding a box of vanilla pudding instead of white sugar!!!! Hi, good post. I have been pondering this topic,so thanks for sharing. I’ll definitely be subscribing to your site. We love chocolate cookies over here. Enjoy your healthy version. They sound good! That’s really funny. I made whole wheat chocolate chip cookies yesterday too (pics on my blog). I was really impressed with how they tasted. I gave them to DH with his lunch, and I’ll be interested to see if he notices any difference. I found this recipe for healthified choc. chip cookies some time ago…made them and loved them…funny tidbit…my 9 year old daughter got so used to my whole wheat choc. chip cookies that she didn’t like regular, cuz they didn’t taste like mine! I am going to try the applesauce in place of butter and the pudding mix instead of white sugar…I will let you all know how they turn out! 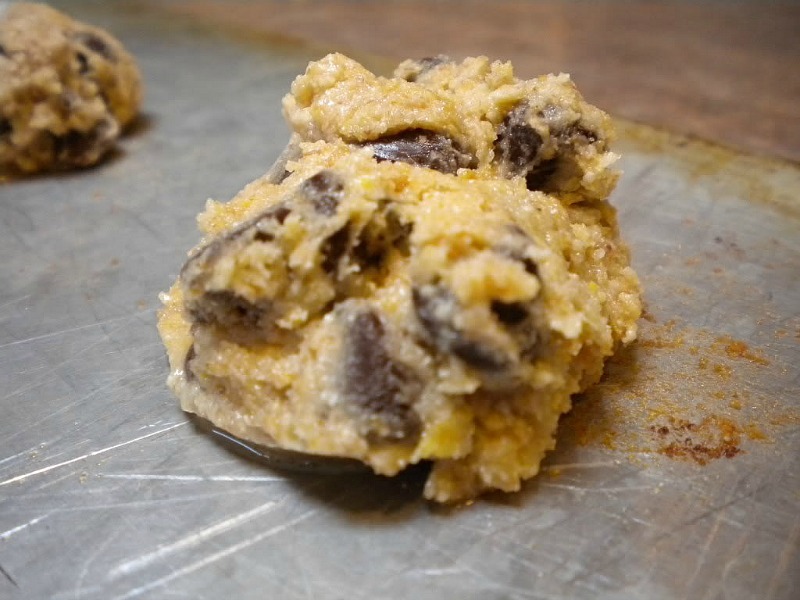 If you use splenda, the cookies don’t brown as much, so be careful you don’t overdo the cooking! also, I think they are much much sweeter with splenda, so it is not cup for cup in my recipes. I substitue dry milk for some sugar as it contains milk sugar. there are good things in eggs, that are not in “fake eggs”, so I do one fake egg and one real egg. I also add oatmeal, just as it is, in my cookies. Last week I forgot to add salt and baking soda and they came out fine, for those who don’t need salt in their diet. they didn’t brown as well or spread as much. I hadn’t thought of putting ground up flax seed in the cookies. However, the Banana Chocolate Chip cookies I make (from VegWeb) calls for a half cup of margarine. (I use Smart Balance Light spread, so i don’t know the equivelant of what the sticks are.) I use all whole wheat flour (One and a half cups), a fourth cup sugar (half of what the recipe says) and about three bananas. I use very little sugar because the bananas and the semi-sweet chocolate chips (either from Kroger, the Value brand or Trader Joe’s) make them plenty sweet. I like the suggestion of using bananas for the margarine. Next time I make them for my family (and not for one of my husband’s meetings, or church, etc. ), I’ll use even less Smart Balance and see what happens. If I get around to cleaning out my coffee grinder, I’ll try the flax seed as well. Oops. I guess it was applesauce for the margarine. That makes sense, as I use apple sauce for oil in other recipes. I’m definitely going to try that. I made these but replaced applesauce for the butter then added peanut butter. Boy, they were GREAT!!!! I like the idea of substituting unsweetened applesauce for the butter, but I’m afraid to go 1:1. I think I’ll substitue 1 of the sticks of butter. I also have Splenda Brown Sugar Blend in the pantry. I think it tasted great in a recipe I did, and my picky teen didn’t notice. I will substitute for the brown sugar and cross my fingers! I made these last week on a snow day. We got 3 ft. Nothing to do but bake. I did not have the wheat flour or flaxseed and just used white flour and we ate all of them I couldn’t keep them away from my boys. Hubby loved them. This is the recipe I use from now on! I will make it one day with the wheat.